2 February 2017 saw the latest edition of Buildin’Green. That is the annual conference that connects the green, sustainable building sector with living green. Every year we choose a venue where this connection is already tangible, literally. This year the choice fell on the beautiful, though for many rather remote city of Venlo. Venlo currently boasts a highly innovative showpiece: the new Cradle-to-Cradle designed City Hall, opened last October. The conference kicked off with a few questions for the audience. There were participants from the Netherlands and neighbouring countries Germany and Belgium, and further afield in Europe such as Sweden and Switzerland. A few were older or younger but the majority of those attending were aged 35-55. Approximately half were entrepreneurs in the (living) green sector and the other half were sustainable entrepreneurs, clients and architects. The audience rated their own circular behaviour as marginally adequate and many indicated that their motive for coming was to learn or to be inspired. This meant there was plenty to do for the first group of speakers: Michel Weijers of C2C Expolab, responsible, on behalf of the City of Venlo, for the concept and commission for the City Hall; architect Hans Goverde of Kraaijvanger Architects, responsible for the design of both the building and the surrounding area, and Hans van Cooten of Mostert De Winter, responsible for all the living green. Michel and Hans spoke alternately. Michel started with the big ‘why’. Why should you want to switch from linear thinking to circular thinking? The environment and the exhaustion of natural resources are important issues, of course, but often result in choosing between the ‘lesser of two evils’, which, for most people, provides insufficient motivation to really change. Adding value does just that! For example, insulating a building to save energy is ‘less bad’, whereas designing your building to supply energy (add value) or even to clean the air takes is a huge step further towards being effective. If you learn to think in terms of infinitely recyclable base materials, which will retain their value even after the building’s life cycle, and in terms of added positive value, then you will discover ever more positive effects and maintain enthusiasm, in both the short and long term. You will have departed from thinking in terms of efficiency, speed and square metres, and arrived at thinking in terms of cycles, adding and retaining value and promoting health. That’s quite a challenge for an architect. Hans Goverde explained the innovational contracting and construction process. Suppliers were not asked to deliver an existing product at the lowest possible price, rather they were asked to devise solutions for open questions in co-creation with the principal. How can you incorporate the surroundings into the building, for instance? Which companies and mines will you source your materials from and how will that add value? The key issue facing Hans as an architect, as he explained, is: how can you create a building that cleans the air, promotes health and biodiversity, has its own (grey) water management system and enhances the surroundings? And how do you measure that? The first answer is the design. Delivering a design in which air is drawn into the building via a green atrium and subsequently circulated round the building through a solar chimney, and where rainwater is collected and used, would meet many of the requirements for a healthy building. The second aspect is material use and layout. Using natural materials would avoid a great deal of air pollution. The wooden staircase in the heart of the building has been designed in such a way that will prompt people to choose the stairs rather than the lift. This is another health aspect. The tour de force however, meeting demands regarding both health and environmental enhancement and greater biodiversity, is of course the enormous green wall. More than 2000 square metres of green lung. 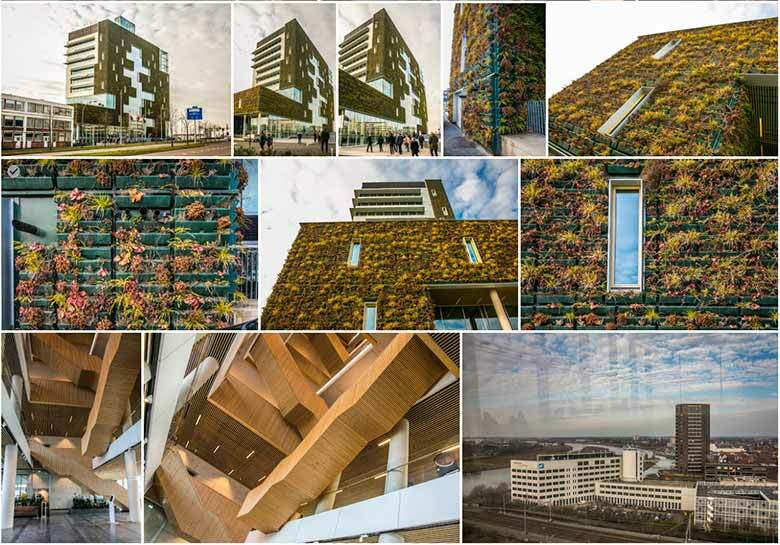 Research by Eindhoven University of Technology demonstrated that the City Hall’s green wall removes up to 30% of the particulate matter from the air. Together with Maastricht University, Royal Haskoning is currently researching whether this, in every respect, healthier working environment actually has a positive effect on performance and absenteeism. Staff costs are by far the largest cost item for any organisation. An increase in staff productivity of just 1% would generate an annual saving for the Venlo municipality of €480,000. The study will run for another three years. However, Michel and Hans could already to give some indication of the financial effects of this approach. If you think in terms of life cycle, residual values and relevant supplier agreements automatically spring to mind. The municipality dared to spend 3.5 million euros more on insulation and solar energy because they could demonstrate that, again thinking in terms of life cycle, the building would generate revenue rather than costs within just 3.5 years. Hans van Cooten of Mostert De Winter went on to explain the process from the landscaper’s point of view. There was not a single green wall on the market able to operate in a circular building process. 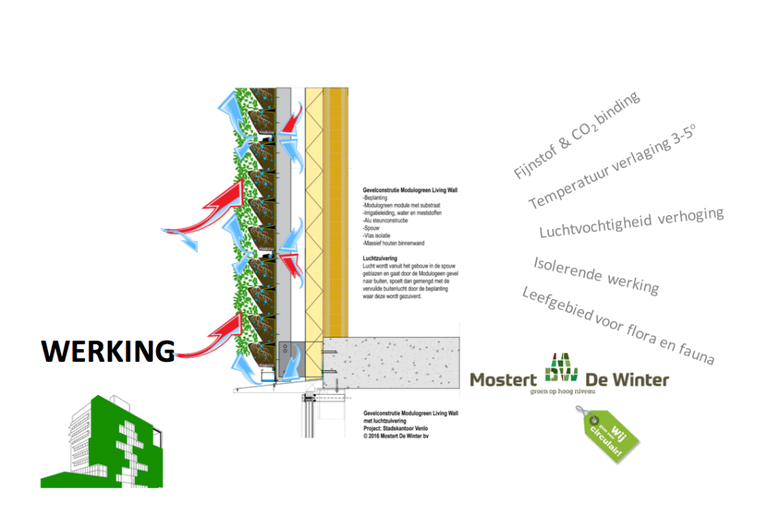 Besides designing their Modulogreen system to meet stringent certification criteria, Mostert De Winter also turned this green wall into a “raw materials store”. At the end of the building’s life cycle all the plastic will be removed, ground and transformed into new products. He also showed how the wall purifies the air, improving the climate both inside the building and in the surrounding area. The air is drawn from behind/inside the building and mixes with the upward flow of air across the wall. This air is then purified by the vegetation growing on the wall. After listening to these enthusiastic speakers, we were all given a guided tour of the building. We were shown round in groups of 20, through the public ground floor areas, up via the atrium and then slowly back down again via the stairs. Back in the hall, we were asked what had struck us most. Interestingly enough the majority of the audience had expected there to be more living green actually inside the building. No sooner had we returned to the hall than we received an earful from none other than Thomas Rau. What do you mean certificates? What do you mean circular, sustainable, Cradle 2 Cradle and climate agreements? Before you know it, stakeholders will have turned every good idea into an anonymous process, no longer owned by anybody, and things will revert to business as usual and, ultimately, to the same old used-material wasting, money-making linear model. If we really want to change then we really will also have to rethink all our processes. He illustrated this with the example of the roof of the new Liander building. Existing suppliers of metal roof constructions want to sell as many square metres and kilos as possible and have no interest whatsoever in a new concept. A manufacturer of fairground attractions does. Their objective is to build as light a construction as possible, that can be dismantled quickly and easily. Hence this manufacturer supplied a roof constructed using 35% less material. So who rethinks the processes? That will usually be an external party with an interest in things really becoming more effective. He went on to tell us about the ‘Madaster’, a cadastre or land registry of materials used in a building. This is a project he set up and is now donating to the government and the general public and which will soon be online. The project is closely linked to another great idea. He advocates the introduction of a declaration of material rights, analogous to the need for the declaration of human rights, and a permanent seat for nature on the United Nations Security Council. The cherry on the cake that afternoon was the presentation of the 2017 Best Interior Landscaping award. The nominees were Lely Campus Maassluis, by Van Ginkel Interieurbeplanting B.V., AQUAradius Hoofddorp by Roessink Interieurbeplanting and Joolz Amsterdam by Growndowntown. All three are highly inspirational projects where green quite literally adds value to the buildings of which they have become an integral element. The winner was Joolz. 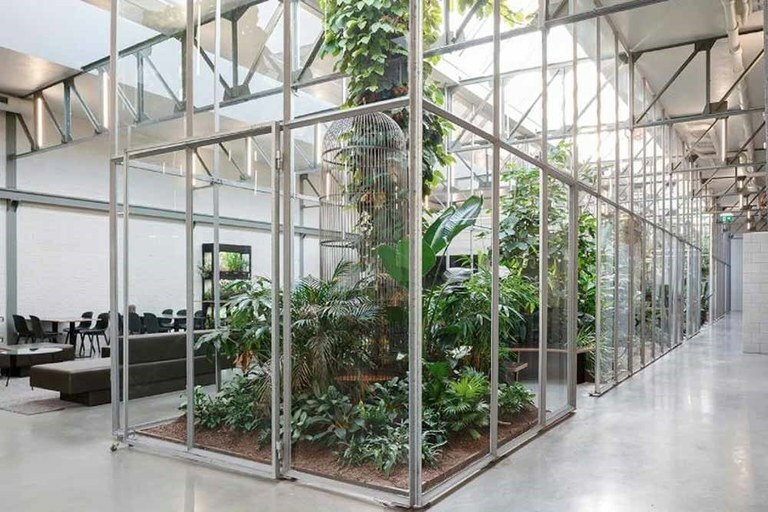 The reason being that besides demonstrating tremendous creativity, the project also provided a successful technical solution to the fact that here, greenery was actually to form part of the air conditioning system. The theme of the afternoon was linking green with green. Living green is a natural part of, and adds value to a building. Living green adds clean air, more perception, more biodiversity, more beauty and an enhanced sense of well-being. It is becoming ever easier to develop circular building into measurable business cases, as it is based on thinking in cycles, effectiveness and life cycles with values. Thomas Rau planted the seed for further thought. We will have to learn to drastically rethink the current linear systems and do that soon because, before we know it, our nature and our environment will have run out altogether. View the Buzzmaster screenshots and photos taken on the day. A green and healthy schoolyard for all children?